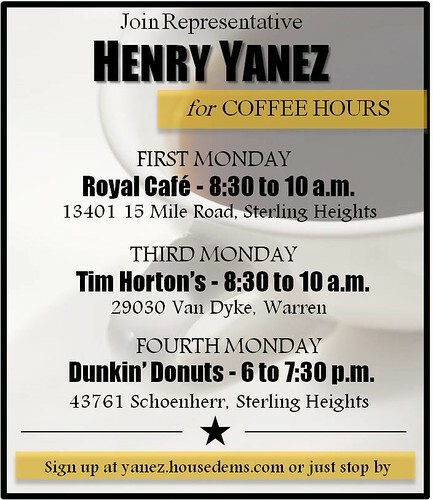 Henry Yanez will work to bring good jobs to Sterling Heights. Rep. Yanez was a proud member of the International Association of Firefighters Local 1557, and is extremely proud of the fact that his father put in 48 years at the Ford Motor Company. The union to which Henry belonged was his second family and allowed him to give my two children a college education and the promise of a middle class life. The unions in Michigan and around the country have allowed workers to provide the American dream to future generations. To break that promise in this state is to destroy Michigan’s middle class. As YOUR Councilperson, Henry will continue to fight to keep collective bargaining rights for our workers, support access to affordable health care and help families keep food on the table.